Israeli forces on Thursday took over the remains of three abandoned Jewish settlements in the northern Gaza Strip and entered a nearby Palestinian town, creating a temporary buffer zone to prevent Palestinian militants from firing rockets at Israel. No one was hurt in the attack on Ashkelon, a city of 110,000, but it infuriated Prime Minister Ehud Olmert, who pledged the rocket strikes would have "far-reaching consequences." Critics say it shows the Gaza pullout nearly a year ago was a complete failure. Hamas gunmen holding kidnapped soldier Gilad Shalit have not released any information since Israel refused to meet a Tuesday deadline to release more than a thousand Palestinian prisoners. "We're not going to negotiate," Israeli Defense official David Hacham said. Israeli forces battled Palestinian militants west of Beit Lahiya in the northern Gaza Strip on Thursday afternoon, killing six militants, Palestinian medical officials said. The incident raised the death toll in Thursday's fighting in Gaza to 12. Israel suffered its first casualty of the operation when a soldier was shot in the head on the outskirts of Beit Lahiya. Cabinet minister Binyamin Ben-Eliezer said the Israeli tanks and troops would avoid entering the densely populated towns of Beit Lahiya and Beit Hanoun — which are often as rocket launching grounds by militants. "We have no intention of staying in Gaza, but if it will be necessary we will continue to apply the pressure," said government spokesman Raanan Gissin. Countered Palestinian legislator Saeb Erekat, "I don't know what will this do other than strengthen extremism, add to the complexities, enlarge the cycle of violence and that's my point." Israeli leaders said their aim is to stop the rocket fire and bring back the captured soldier, and there are no plans to reoccupy Gaza. "We have no intention of drowning in the Gaza swamp," said Defense Minister Amir Peretz. 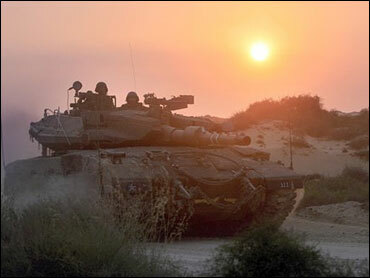 Israeli artillery and aircraft assisted the ground troops, striking bases and groups of militants. Earlier in Beit Lahiya, Palestinians fired at a car carrying a crew from the Arabic satellite TV channel Al-Jazeera, wounding two people, said Wael Dahdouh, one of the reporters in the car. The gunmen apparently thought the reporters were Israeli undercover agents, he said. The destroyed Jewish settlements — Nissanit, Dugit and Elei Sinai — are in a strategic location just along the border with Israel. Before Israel dismantled its Gaza communities, critics of the withdrawal warned that the pullout would put more Israeli cities within rocket range. A buffer zone could be the only way to keep Israeli population centers out of rocket range. But such a zone brings back bitter memories of a similar tactic Israel used in southern Lebanon, when its forces held onto a security zone for 18 years in an attempt to prevent Hezbollah guerrillas from firing rockets at Israel. The guerrillas still fired rockets, and the zone became a deadly battlefield. Pressure from Israelis opposed to the occupation finally forced Israel to withdraw in May 2000. Hamas said in a statement Wednesday that the rocket fired at Ashkelon was a new, longer-range weapon that can hit targets at least 7.5 miles away. That could mean the Gaza buffer zone would have to run deeper than the area of the abandoned settlements, bringing forces into populated areas the army is reluctant to enter. Forces also remain in southern Gaza, an area invaded after Shalit was captured in a June 25 attack on an Israeli outpost. Their main goal is to find Shalit. The kidnappers are reportedly prepared to lower their price, but reject Israel's demand for an unconditional release of the captive soldier, reports Berger. Egyptian and Turkish mediators were trying to end to the worsening crisis. The Hamas-linked militants holding Shalit have demanded that Israel release hundreds of Palestinian prisoners in exchange for information about the captive. Israel has publicly refused to negotiate with the militants holding Shalit, but could be indirectly communicating with Hamas through mediators. In a statement, U.N. Secretary-General Kofi Annan called on both sides to "step back from the brink." He said the soldier must be released and Israel must avoid collective punishment of the Palestinian people. Israel clamped a total closure on Gaza after the soldier was captured, trying to prevent militants from moving him out of Gaza. In the last two days, Israel has reopened two crossings to allow badly needed food and fuel into Gaza. The Gaza-Egypt border was to open briefly Thursday to allow Palestinians stuck on either side to return home.